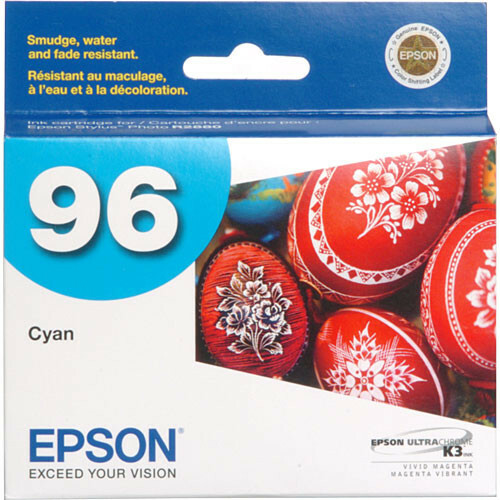 The Epson 96 UltraChrome K3 Cyan Ink Cartridge is part of a professional ink set for the Stylus Photo R2880 Printer that includes advanced magenta pigments to makes it easy to achieve exhibition quality prints with more dramatic blues, purples and reds. This pigment ink set also offers impressive color stability immediately after printing, and provides print permanence ratings of 200 or more years for truly sellable color and black-and-white prints. Box Dimensions (LxWxH) 4.45 x 4.45 x 0.75"
96 UltraChrome K3 Cyan Ink Cartridge is rated 4.9 out of 5 by 33. Rated 4 out of 5 by Eileen Arbus from 9 ink cartridges for my Epson Printer 28 This is my first archival printer. And my prints have been beautiful due in part to the archival inks. The inks are great because the colors are consistent. They are affordable... However, the cartridges do not last all that long. That is my biggest complaint. I don't really print often enough to purchase the inks that don't come in cartridges. Rated 5 out of 5 by Spence Fairbanks Photography from Quality is most important I am a professional photographer so quality is very important. Using genuine Epson ink is a must. I want to be assured my customers are getting what I promise them. 3rd party ink is just not an option for me. Rated 5 out of 5 by Anonymous from Works Great Tested by printing out pic on Epson paper and placing in very bright, direct sunlight for two months now. No apparent fading. Very happy. Rated 5 out of 5 by DCWells from Excellent Color Rendition The Epson r2880 does an exceptional job with the K3 cartridges in color accuracy and vibrancy. B&H has best prices for the K3 sets. Rated 5 out of 5 by Anonymous from Great Ink I use this ink set in the Epson R2880. It always provides faithful reproduction and vibrant prints. Rated 5 out of 5 by Gregory from Excellent quality Epson printers and Epson ink are top quality. I have never had any problem with either.